Alright. You asked for it. ^_^ Some major changes were in store for Kyouya, particularly in volumes 8 and 9 of the manga. In the beginning of volume 8, Yamaki's wife, Yukari, is in hospital, pregnant and soon to give birth to their first child. Kyouya and Narita are there as well, watching over her.. however, Yamaki has to go off to do a job. 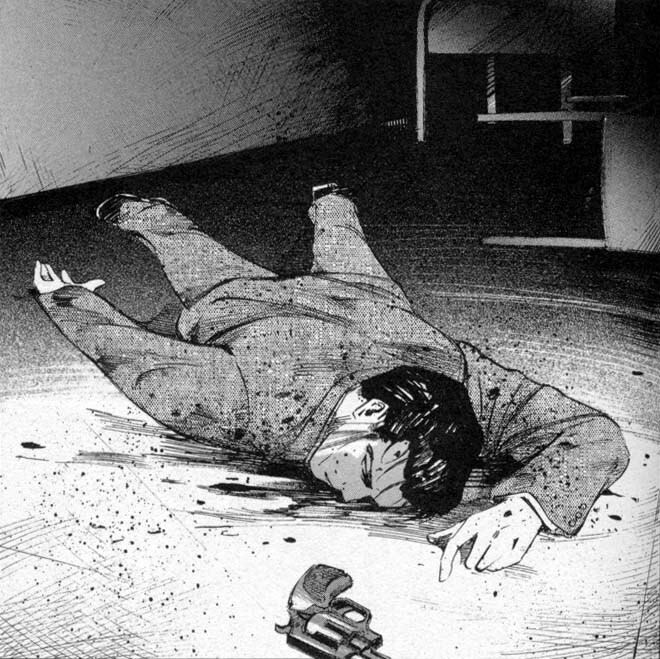 Things go awry though, as some punk kids break in, paid to kill the people Yamaki is looking after. 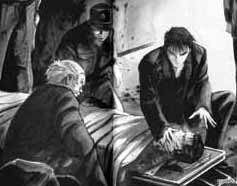 Yamaki kills one of them, but the other goes berserk at the death of his friend.. and kills Yamaki. Kyouya receives the call at the hospital. And Yukari gives birth right about the same time. But Kyouya and Narita have to leave and go to the scene of the crime.. I know this is really soppy of me, but I almost cried when Kyouya knelt over Yamaki's dead body and gently touched his face. *sniffle* Yamaki was the sweetest guy, and a great partner to Kyouya. And he was about to have his first child! It's so sad. Well, at least his child is healthy and happy. Kyouya pays Yukari a few visits.. who knows, maybe he'll take care of the two of them somewhat. I think that despite Kyouya's aloofness, Yamaki and Yukari managed to get close to him.. at least as close as anyone has that I've ever seen. Kyouya's new partner turns up in volume 9. It's a woman! Yay for equality! ^_~ Her name is Eriko -- or Aizawa Eriko, to be precise. She's young, early twenties I think, and very pretty. I'd say she's new to policework in general.. she starts off rather nervous and unsure about what she can do and how far she can push things. But after her first case, which is rather stressful and includes her being kidnapped, I think she toughens up quite a bit. ^_^ Besides, with Kyouya as a partner, I'd say being tough is a given. *grin* She's a little more emotional than our cold-hearted Kyouya, but she still seems quite happy to pull out her gun and shoot without hesitation, just like him.. that is, after the first case! ^_^ She gets shocked by him sometimes (just like Yamaki used to!) but policework seems to make her tougher than Yamaki was; he was never quite so affected by it as she is. There are several pictures of her on the later manga volume pages. In the file that spans volumes 18 and 19, Eriko gets married to her longtime boyfriend, but things go terribly wrong and he is killed outside the church by a stalker who was pursuing Eriko. (Waaah.. she didn't even get to enjoy married life for one day! ;;^^) Narita's only daughter, Atsuko, is also killed as a result of the shooting. 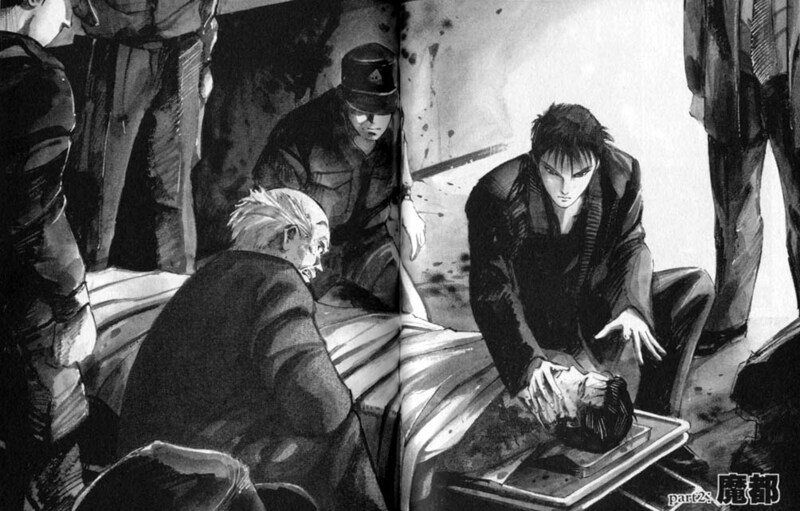 And not long after, Narita is shot down and killed by the woman who recieved Atsuko's heart as a transplant. It's a sad time for everyone. *sniffle* But we do get to see Yukari again, and meet Yamaki's son, who is now four years old and very cute. Well, those are the main spoilers. ^_^ For those reading MixxZine, I didn't want to put anything about Yamaki or Narita's deaths on the main page.. it's a long way off for them (if they ever get to it) and if they don't want to know, it would be rather upsetting. Oh, and first two small pictures above are thumbnails -- click on them for large versions of the pictures.